It’s the day before Thanksgiving and you just realized that you don’t have a centerpiece. Having been so consumed with other worries like buying the turkey, making gluten free sides for your sister and keeping your daughter from bringing this new boyfriend of hers; it’s no wonder it slipped your mind. No sweat. 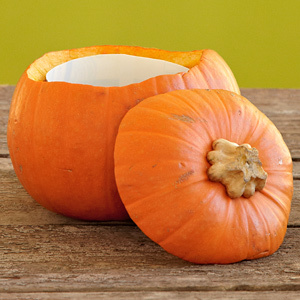 We’ve got you covered with this quick and easy pumpkin vase project. Grab some pumpkins and let’s get started. 1. 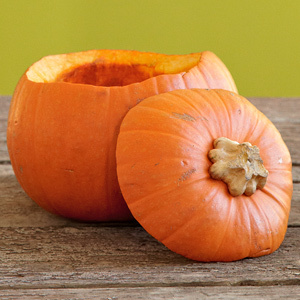 Cut open pumpkin by carving a circle around the stem. Be sure the opening is big enough for your plastic container to fit inside. Scoop out the insides and pat dry, if necesssary. Got extra time? Separate the seeds and roast for a delicious salty snack. 2. Cut plastic container to size and place inside. An old yogurt container works well for this. 3. Add seasonal flowers and water. We used mums and accented them with hypericum berries, yellow solidago and a pine cone. Feel free to do your own thing here. Repeat the process with a few more pumpkins if you have a larger table. Now wasn’t that easy. You’ve got a clever centerpiece and possibly a warm snack if you were feeling ambitious! DIY not your bag? 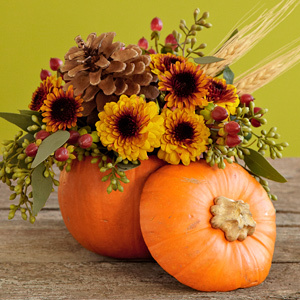 Check out the product that inspired this project, our very own Thanksgiving Pumpkin gift. Makes a great table accent all season long!